It happens: Liberated negative space — it is a Thing! Black Cat v. Catwoman with a little PSA-war action. Catwoman has herpes. The Bad Kind! Black Cat gives rotten head. Meow. Hey, have you got Something Special on your mindgrapes? Be cool: Say it with spray paint! 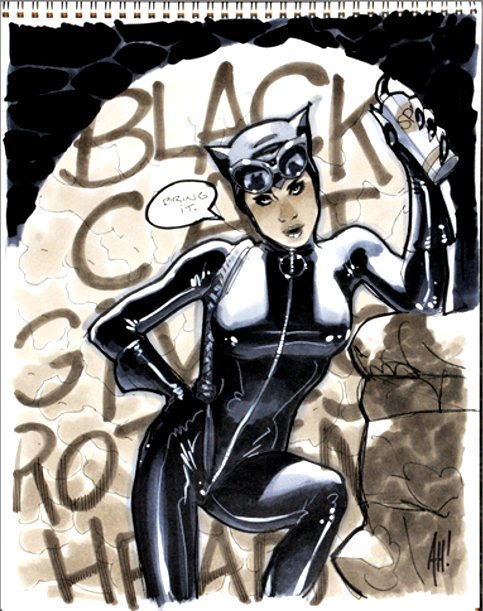 Sketches by super-neato-terrific Adam Hughes, on whom my neverending artcrush knows no bounds.